An alleged victim of ‘fake doctor’ Oneal Ron Morris has come forward to show the horrific state of her face after it was injected with a toxic mixture of cement and tyre sealant. Rajee Narinesingh, 48, from Miami, Florida, says her face was ruined by Morris, who had just been released from custody after she was accused of administering the potentially lethal shots to another victim. Ms Narinesingh, who, like Morris, 30, was born a man, but lives as a woman, said she suffered acutely lumpy cheeks, misshapen chin and ballooning upper lip after the back room beauty treatment. 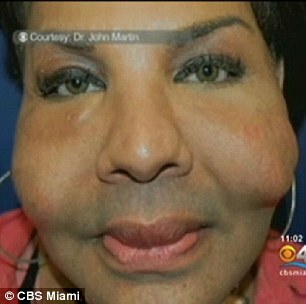 She admitted that she initially turned to Morris because she did not have the money to pay a licensed plastic surgeon. She says she learned of him by word-of-mouth in the transsexual community. 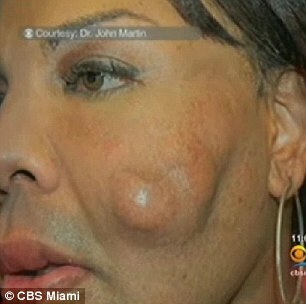 Ms Narinesingh has since had several plastic surgery procedures to repair the damage, and faces more still. ‘I had to end up going to surgery, to get me even to this point,’ she revealed. Morris, who was released from custody late last night after posting $15,000 bail, declined to comment as she left the Miami Dade County Jail. She said only that she has a lawyer to answer reporters’ questions, and the lawyer claims she is innocent. She was arrested earlier this month for practising medicine without a licence and causing serious bodily injury after a patient complained that she injected cement and a chemical compound called Fix-a-Flat, which is used to mend car tyres, into her backside. The treatment left the victim with life threatening injuries, needing several surgeries and round-the-clock care. Since Morris’s alleged practices came to light, prosecutors say several victims have come forward. A court was told that Morris used cement, mineral oil and Fix-a-Flat, in her backroom beauty treatments. It heard that she then used superglue to patch up entry wounds in the skin. 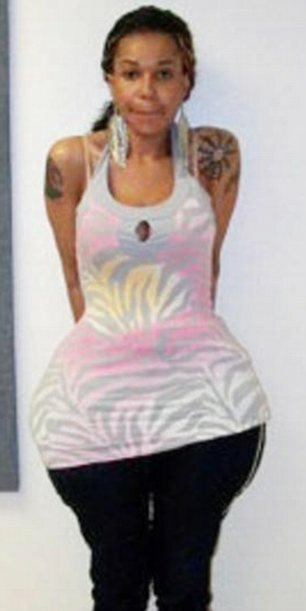 Her arrest photographs show an apparently enhanced rear. Detectives say she performed the potentially lethal treatment on herself. Morris is now free on bond but the probe by the Miami Gardens Police and health officials is continuing. Dr Dr John Martin, who is now treating Ms Narinesingh, said he has been giving her therapeutic injections that he hopes will eventually soften the hard nodules that formed in her face and return her to a more normal appearance. ‘There is not an easy solution to this nightmare,’ he said. Ms Narinesingh says she is grateful to Dr Martin for trying to help give her a face back. ‘I have learned my lesson,’ She said. ‘I could have died. I know that now.